Identifying what matters to you and your personal brand sounds like an easy task, but most people don’t think very much about it. You probably go about your daily life making split-second choices (often subconsciously) rather than trying to make each decision based on whether it jibes with what’s important to you. Developing a personal brand requires being more aware of yourself and your choices. There are a variety of ways that you can heighten your awareness of the things that really matter to you. To look at what matters to you, you first need to identify what you need. Needs develop unconsciously as you grow up and become a central part of your character. In order to brand yourself, examining your needs is crucial. 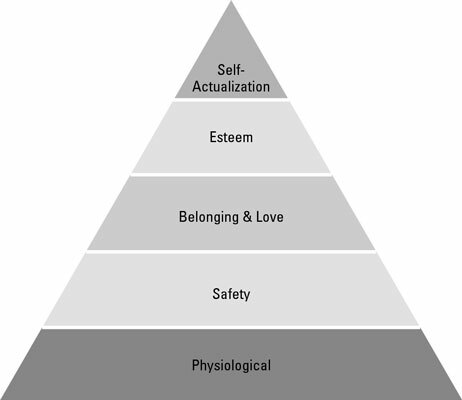 Abraham Maslow developed a theory called Maslow’s Hierarchy of Needs that states that you must have your basic needs met before you can examine your higher-level needs. The figure illustrates Maslow’s hierarchy. Starting at the bottom, each level of need must be met in order for someone to be able to consider — and work toward — meeting the next higher level. Maslow’s theory illustrates that if you have physiological needs — you are hungry, tired, cold, or hot, for example — you won’t be able to concentrate on much else. If your physiological needs are met but you have safety needs — you don’t feel safe in your environment — you can’t worry much about fulfilling your need for belonging and love. If all three of the lower levels of need are fulfilled, you can start to focus on esteem, which is where personal branding can really start to take place. This level of need involves being able to feel that you do your job well, respect yourself and others, and align the work you do with your sense of self. This alignment is absolutely necessary in order to authentically build your personal brand. The highest level of need is self-actualization. Maslow described self-actualization as becoming everything that you’re capable of becoming. Striving toward fulfilling self-actualization is the goal of personal branding. If you achieve that goal, you get to be who you really are, and you’ll shine brightly. To help connect the hierarchy of needs with what happens in your workplace, look at the table, which spells out what needs fall into each of Maslow’s categories and then looks at the hierarchy through a work-specific lens. Needs direct your feelings and influence your values. They influence your motivation. Determining what you need will help you understand what you value and where you need to set your goals. What needs of mine are met? What needs of mine are not met?